This is the web-only special limited edition of 1000 copies. 222 minutes. 3-CDs in matte DVD-styled digipak. Focusing on ambient “zones” created as tone meditations for the living space, immersion : three is a stunning new release in the long-form ambient genre. 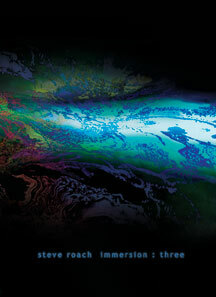 With one composition per disc, the nearly 4 hours of all-new material on immersion : three display Steve’s quiet mastery of immersive ambient soundworlds. Gently effective at low volume, the non-dynamic nature of these spaces supports focused day and night activities. Minimal in nature and sonically uninterrupted for 74 minutes per disc, these pieces bring Steve’s years as a sound painter of deep subtle spaces to a rarified point in time. immersion : three is perfect for creative states, sleeping, reading, long hours at the computer and other functions where traditional music could be considered invasive. This release is especially effective in dissolving the sense of linear time.